A daring escape or a curious creature? A viral video of an octopus at the Seattle Aquarium appears to show the invertebrate attempting to leave its display tank. Octopuses are among the most intelligent invertebrates on the planet. 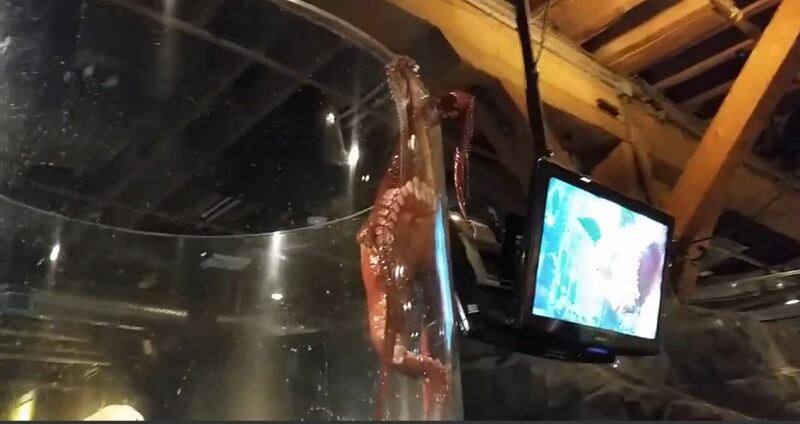 The video shows the octopus, whose name is Ink, scaling the side of a clear glass tank. Several of its tentacles reached over the top of the tank in its pursuit of freedom. Onlookers managed to prevent an escape. Aquarium officials deny that the octopus was attempting to escape. In recent weeks, the Seattle Aquarium — which opened in 1977 and has nearly 1 million annual visitors — has released two of its octopus occupants back into the wild. According to the aquarium, biologists escorted the octopuses to a new home in Puget Sound. This isn’t the first time that the Seattle Aquarium’s octopus exhibit made headlines. Just last month, the aquarium attempted to set up a “blind date” between male and female octopuses on Valentine’s Day. “Aquarium biologists will set the mood with decorative hearts, roses and romantic music at the Octopus exhibit. Will her three hearts skip a beat? Will he wrap his eight arms around her?” a press release asks. As for Ink, aquarium officials fastened a top over the exhibit to prevent the 90 pound octopus from escaping. The aquarium says that Ink will be released from captivity in the next year. He is being studied as part of an education and conservation program.